Why'd October have to go so fast? Halloween is here and while that's awesome...it's also sad. Pretty Ghoul Science is almost gone for another year. I had to go out with something dramatic! Generally fang manis are done with two fake nails, but it seemed like the perfect way to end my all-too-brief stiletto stint. 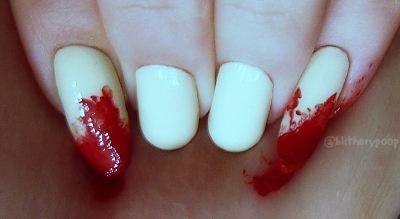 The toof color is Wet n Wild LAC - My Mani? and the blood is Urban Outfitters Blood, with a little yellow added. 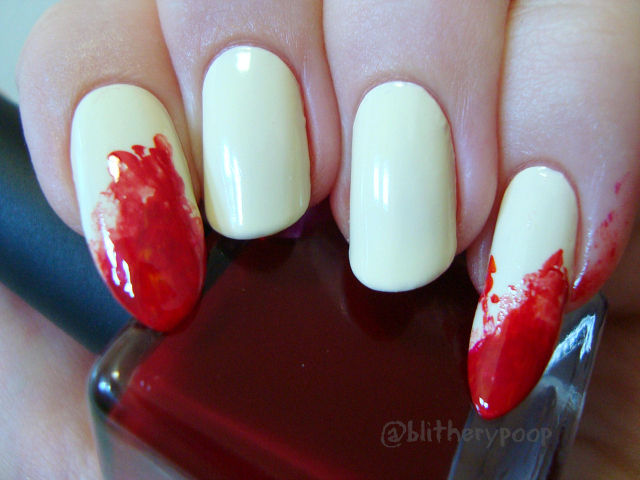 I covered my right hand in a plastic sandwich bag, put the "blood" on the bag and "bit" it with my nail/fangs. I wasn't sure if it would work, but I like how it turned out. I also left some of the "blood" on my pinkie...because why not, right?